DAY 2! I'm pissed about today. Things did not go according to plan, but this will have to suffice as it's getting late and I don't have time to repolish, rephotograph, and repost a new one. It's passable, but definitely not my best work. I blame it on the rattling motorcycle I was riding around earlier. I'm an excellent back seat accessory to a motorcycle, let me tell you. I love the polish that was used today. It's called Pirate's Booty and it's from Polish Rehab (Facebook and Etsy). Hayley has crafted some great glitter collections since the conception of her store, and I was pleased as pickles to be in the know early on so I could grab the glitters before their popularity took off. It since has, as you can see by the lack of product currently for sale, and for good reason. It's a bit hard to make out over Hey Sailor (China Glaze), but there are red glitter pieces in addition to the black and gold. 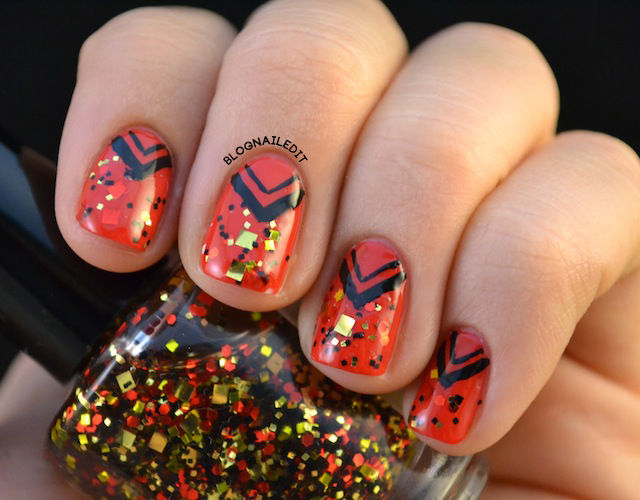 Baby squares, big squares, and hexagonal shapes are all found in this polish. Again, I apologize for the bumpy appearance this manicure is giving off. I used the tape method, but unfortunately, letting the glitter layers dry before adding another doesn't work well with taping. It'll just goo-out on you, and you'll be peeling off a filmy layer of polish with the tape. Aww haha. It still looks cool!